Allan Merson was a scholar, an academic, a World War Two veteran, and a communist. It is the last activity that earns him his place in the People’s History Museum. Merson’s life, told in the archive through letters, photographs and his extensive body of published and unpublished work touched many different people for many different reasons. Sifting through the boxes of his papers and correspondence, kindly donated by his step daughter Joanna Bornat in 2012, an image of a man who was complex and deeply respected is formed. Merson was born on 26th August 1916 in Northumberland. After excelling at school his intention was to become a minister for the Presbyterian Church as other family members had done before him. But his passion for history led him to Balliol College, Oxford in 1934. There he found a lifelong friend in Christopher Hill, a well known English Marxist historian. Influenced by the events of the Spanish Civil War, whilst studying at Oxford, Allan Joined the Communist Party of Great Britain. Throughout his life Merson was an active participant in the CPGB, mainly in Southampton, campaigning locally, speaking at meetings and generally supporting his branch and Hants and Dorset district. 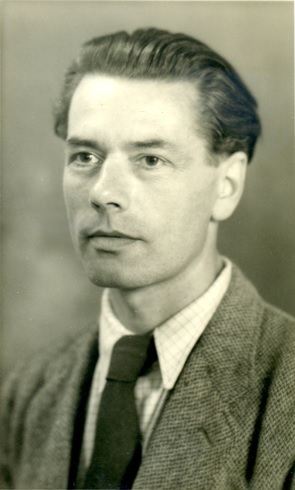 Upon completion of his studies in Oxford Merson received a travelling scholarship which took him to Nazi Germany where he worked as an English Assistant at a school in Würzburg. He also spent time travelling in other parts of Germany and France and became fluent in both languages. However, on the outbreak of war in 1939 he was conscripted in March 1940 to the Royal Artillery Signals Training Regiment at Dover Castle, later joining the Intelligence Corps. His involvement took him to Iceland in October 1940. He recalled his time there with fond memories describing his time in Iceland as more of a holiday. While there he was in charge of a number of operations, which he recounts in his memoir notes. One of his first tasks was interrogating Germans who had settled in Iceland before the war and had since gone in to hiding. 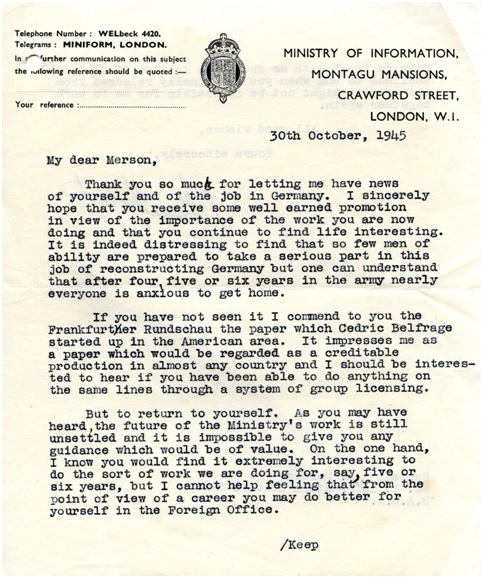 Another task involved keeping the remaining German residents of Iceland, of who most were ‘Jewish or left-wing refugees’ – a group who posed no real threat – under observation. This was a task he clearly found pleasurable claiming ‘this was much a labour of love, for several of them were cultured and interesting people’. Such was affection for the people and culture of Iceland that he became fluent in the language and his first wife came from that country. Another role was testing security of friendly military bases. He recalls having to ‘steal’ a truck from a camp, and all though making plenty of noise, having never operated a vehicle on this scale before, was able to drive away without any queries from the soldiers. In another anecdote, a friend made it through the gates with a forged pass bearing the name ‘Benito Mussolini’. While posted oversees he continued to be an active member of the Communist Party, seeking out fellow British and Icelandic members. In 1946 he became a Lecturer in the Department of History at the University of Southampton, a position he held up until retirement in 1977. While there he specialised on the Third Reich and the English Civil War. He regularly attended meetings gave lectures and wrote pamphlets for the Communist Party History Group. While completing research for his book on communist resistance during the Third Reich – Communist Resistance in Nazi Germany – he spent time in both Germanys having a particular affection for the GDR. In the course of his research he made many contacts around the globe world with whom he kept in touch throughout his life. Married twice to Margret (divorced 1959) and Elizabeth (died 2011). Allan Merson died on 28th October 1995. This blog post was written by Elizabeth Thorpe a volunteer in the Labour History and Archive Study Centre, People’s History Museum, who has been working on the Allan Merson collection.